Every year, my in-laws have a themed BBQ in August to celebrate my husband and father-in-law’s birthdays. Last year, the theme was tiki, and I made these tropical tiki cupcakes. This year, the theme was Oktoberfest, so I thought soft pretzels would be perfect. 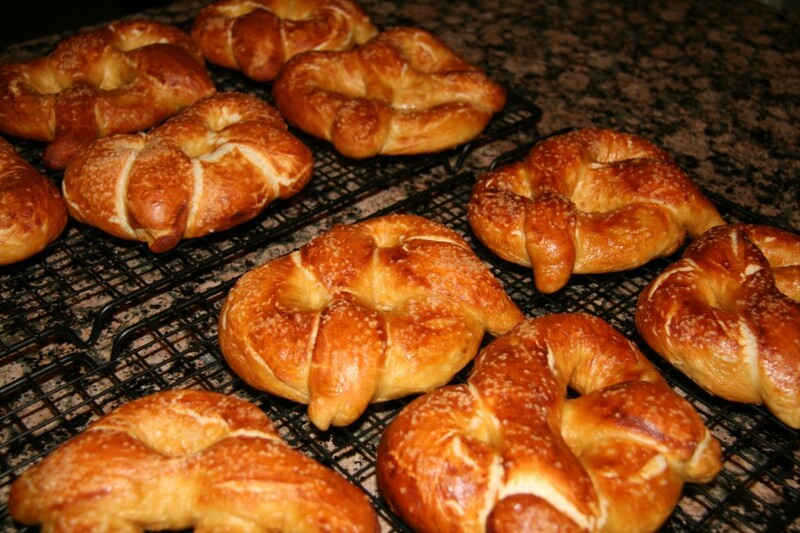 I have never found a pretzel recipe that I really loved, and especially one that tastes good the next day. But, I found this recipe online from one of my favorite blogs, Brown Eyed Baker, and I figured I would test it out. I have to say, these are the best tasting pretzels I have ever made, and they were still great the next day. I just put them on a foil-lined cookie sheet and warmed them up in the oven for 15 minutes at 375. 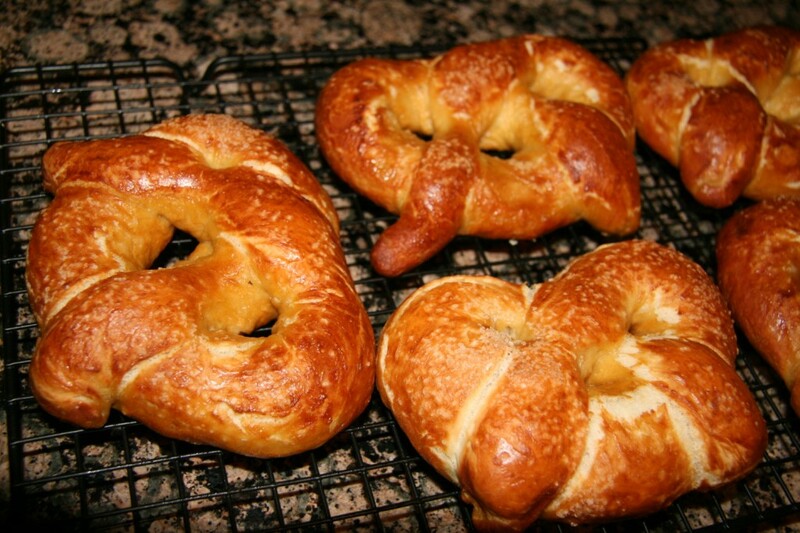 I’ve also never found a pretzel recipe that browned as beautifully as these did! This recipe comes out so puffy and golden, it’s amazing how big they get after being boiled. I thought I would have these tiny pretzels, but they ended up being a great size. The dough was also great to work with. Just make sure to really flour your hands before rolling the dough. It really did double in size after waiting an hour. I never had that happen before. Usually the dough rises, but not all that much. I will definitely be making these again. They went like hotcakes! I made 4 batches, or 32 pretzels. Every single pretzel was gone within a few hours. So here’s the recipe! The real Oktoberfest is next month, so this is a great way to celebrate. Preheat oven to 450 degrees. Line 2 or 3 cookie sheets with parchment paper and brush on vegetable oil all over the paper. Mix the water, sugar, and salt in a bowl and sprinkle yeast on top. Let sit for 5 minutes until foaming. Add in the flour and butter and mix with a Kitchenaid mixer using the dough hook. Mix on low speed until the ingredients are combined. Then increase the speed so the dough comes together. 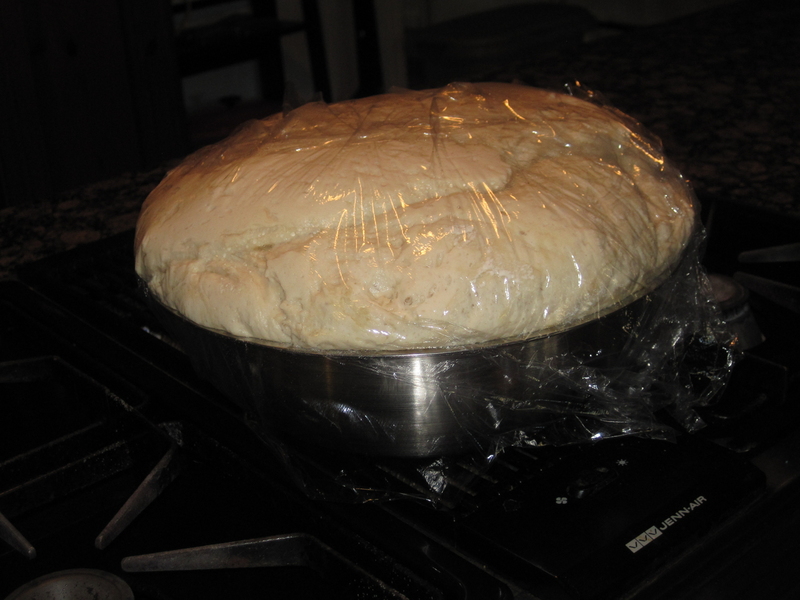 Place the dough in a clean, oiled bowl and cover with plastic wrap. You may want to flour your hands when doing this so the dough doesn't stick. Place the dough in a warm place in the kitchen and let rise for about an hour. It should double in size. Combine the water and baking soda in a dutch oven and bring to a boil. In the meantime, divide the dough into 8 pieces. With floured hands, roll the piece of dough until it is long and skinny, about 24 inches long. 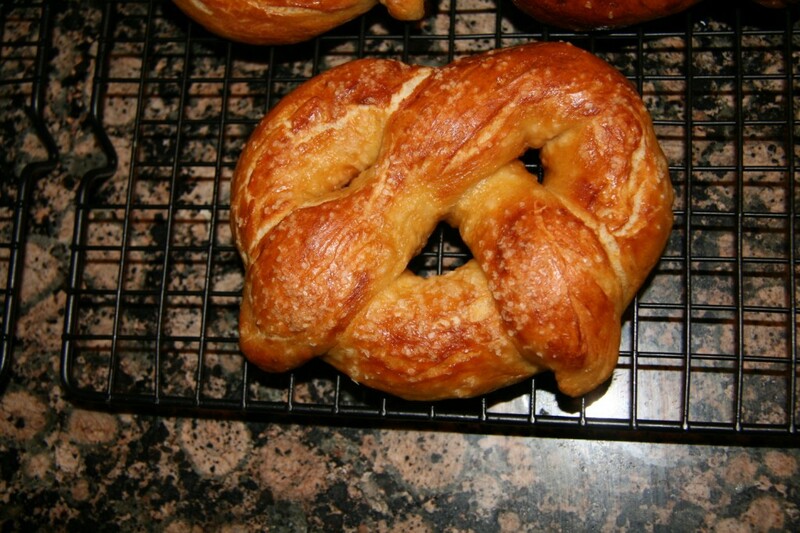 To make the pretzel shape, make a u-shape with the dough, cross the ends, and them down on the body of the pretzel. Once the water is boiling, place 2 pretzels in the water and let boil for 30 seconds. Remove with a spatula and place on the parchment paper. Combine the egg yolk and water to make the egg wash, and brush on the two pretzels. Then sprinkle kosher salt on top. Continue this way, boiling two pretzels, then brushing on the egg wash, and lastly sprinkling salt on top. Bake pretzels for 12-14 minutes until golden brown. Transfer to a wire rack to cool. One Response to Oktoberfest Pretzels! 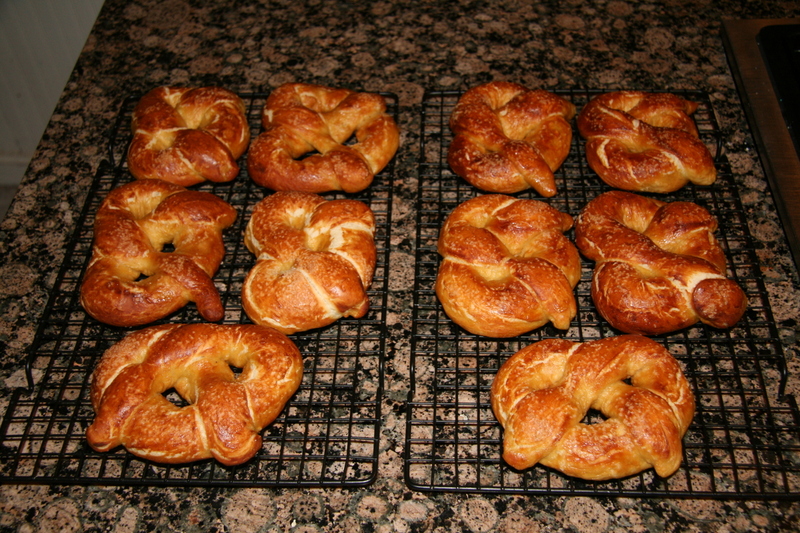 We love soft pretzels, and use a simple recipe we got from Alton Brown (I believe). We’ll have to try these!